Six years after his sprawling and florid 2009 melodrama I AM LOVE, Italian Director Luca Guadagnino returns to the big screen with A BIGGER SPLASH, a starry remake of the French detective film LA PISCINE. A BIGGER SPLASH tells the story of a high profile couple whose vacation is disrupted by the unexpected visit of an old friend and his daughter, creating a whirlwind of jealously, passion and danger. The film features an all-star cast including Ralph Fiennes, Matthias Schoenaterts and Dakota Johnson and also marks the return of longtime collaborator Tilda Swinton. 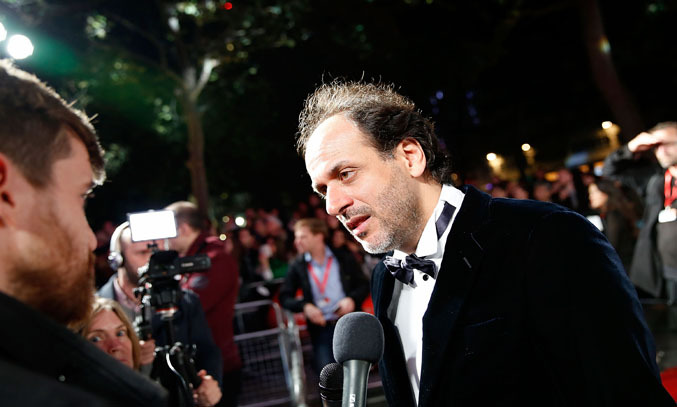 Speaking on the red carpet at the screening of A BIGGER SPLASH at the BFI London Film Festival, Guadagnino talks fondly of his time working on the project but admits the scene he enjoyed shooting most was actually cut from the film. The Italian director also spoke about his latest project, a remake of Dario Argento’s 1977 Giallo classic SUSPIRIA, in which A BIGGER SPLASH star Dakota Johnson is also set to appear. “It is a movie that is very important for my personal and filmmaking upbringing” comments Guadagnino.